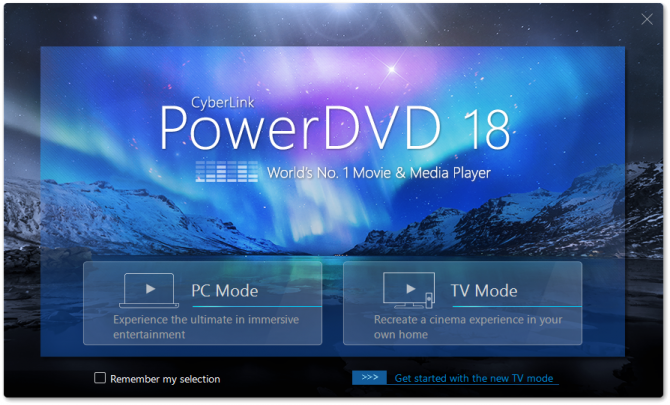 Cyberlink seems to have accidentally made the 18th version of its movie and media player PowerDVD available on its website. Although Cyberlink removed the download link of the software, PowerDVD 18 is now available on several download sites. The file “PowerDVD_18.0.1415.62_Subscription_DVD180110-15.exe” was initially available from this location. While it didn’t took Cyberlink long before it pulled the 212 MB file, it was already downloaded by some users and later also made available on websites offering pirated software. Use crop to fill for a better fit for 2.35:1 Blu-ray video on ultra wide 21:9 monitors. Cast media to an Amazon Fire TV device. Watch 4K and HDR YouTube (VP9/WebM) video without leaving the PowerDVD program. Stream live YouTube videos and play 360 degree Vimeo videos. View multiple angles simultaneously while viewing 360 degree videos and photos. Adds support for VTT external subtitle files for movie files, TV shows, and pinned YouTube videos. Includes exclusive audio output (WASAPI Exclusive) support for supported media shared on network (DLNA) media servers. Smoother and precise audio scrubbing when watching videos. More PowerDVD UI customization options and other user experience improvements. Also the several system requirements have been posted along the changelog. For HDR 10 video playback on PowerDVD the following is required; Intel 7th generation Core i Processors integrated with Intel HD Graphics 630 or Intel Iris Graphics 640, and NVIDIA GTX 950/960, 1000 series (for HEVC HDR 10), GTX 1080 Ti, GTX 1050, GTX 1050 Ti, or GT 1030 (for VP9 HDR 10). 4K Ultra HD Video with Hardware Acceleration is possible with the following hardware. H.264/AVC is possible from a 3rd generation Intel Core i5, H.265/HEVC (8 bits) is possible from a 5th generation Intel Core i5 or NVIDIA GTX 960 and for H.265/HEVC (10 bits) at least a 7th generation Intel Core i5 or NVIDIA GTX 1060 is required. Playback of Ultra HD Blu-ray discs requires an Intel 7th generation Core i processor or above. The CPU needs to support the Intel Software Guard Extensions (Intel SGX) technology. It’s unclear when PowerDVD 18 will be officially released. It’s also unknown how much the software will cost, neither is it clear how much an upgrade of an earlier PowerDVD version will cost.